Black and White 1-inch Father's Day Pin Badge. 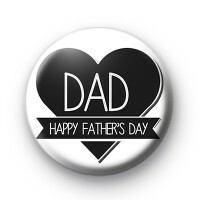 Wish your Dad a Happy Father's Day with this button badge. It has a black heart & the text DAD - Happy Father's Day written in a white font. Your Dad can wear his badge with pride all day - let him know you love him with one of our handmade badges. Family is everything and every dad deserves a badge on his special day.